Nokia World is back !! 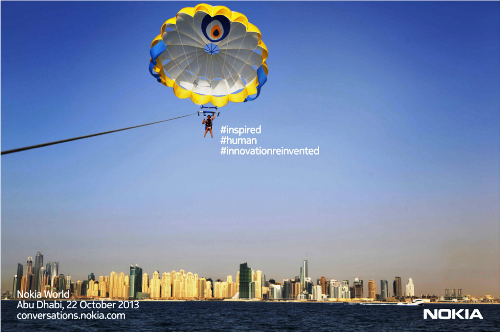 Forget the acquisition news for a while, The biggest Nokia's event, Nokia World 2013 is back and will be held start on October 22nd 2013 in Abu Dhabi, Uni Arab Emirates. 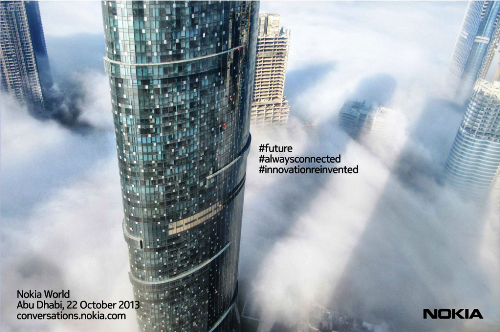 For this Nokia World 2013 event, nokia have a campaign called #innovationreinvented. Based on The Verge's post yesterday, the rumor is Nokia will launch 6 new devices at Nokia World 2013 in Abu Dhabi next October. Perhaps nokia will launch their first 6" Phablet, the new Nokia Lumia 1520 and others nokia devices that already leaked by @evleaks this month. Stay tuned and #bethefirst with @nokianesia , we will keep you informed on October 22nd 2013 to reveals this rumor and give some reports live from Nokia World 2013.